This is the phone I have all my school memories with. My first android smartphone which dad got me. It&apos;s as beautiful and pretty in working as it is by looks. Smooth stock android experience will make you fall in love. The black round body feels good in hands. Just that it&apos;s low on storage side. Couldn&apos;t ask for a better product in the same price range. Great mobile by Motorola. Moto E is the go to smartphone. With affordable cost it has various features. With 1GB RAM and made of cheap material it does give more than one can think of. 3 Pricebaba users have written their experience with Motorola Moto E (2nd Gen) 4G. 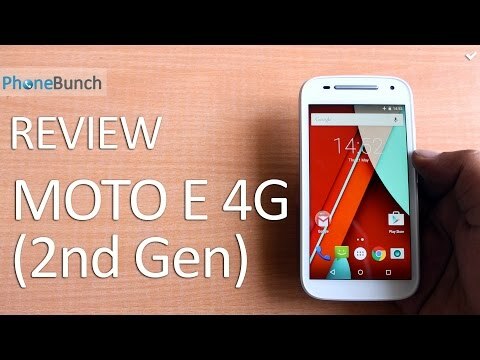 If you own Motorola Moto E (2nd Gen) 4G, please do leave your feedback too. Motorola launched the Moto E 2nd Generation as the successor to the highly successful Moto E. The device is priced similarly to the phone it replaced and have quite a lot of improvements to talk about. First up the 4.3 inch display has been grown to a much required 4.5 inch with a better resolution of 960 x540 pixels. The screen is pleasant to look at and has decent viewing angles. The newest addition on the front is a VGA camera, something sorely missed on the older model. The 4G variant of the new Moto E supports VoLTE and has a Snapdragon 410 Quad Core chip clocked at 1.2GHz and the device has 1GB of RAM. There is a cheaper 3G model as well that comes with a Snapdragon 200 processor. At the back the device has a 5 megapixel autofocus camera with a secondary microphone at the back. The camera is capable of 720p video recording but is surprising to see that Motorola still hasnt given a flashlight in the updated device. The device runs on Android 5.0.2 Lollipop and was very responsive. Motorola has kept the software stock while baking a few features from its other models. The new Moto E now has Moto Display which lights the screen up when there is a notification allowing the user to glance at it. Quick Camera launch using the signature double crank gesture along with other apps like Moto Alert and Moto Migrate. The shape of the device is more or less the same and the back is now non removable. Under the back is a big 2390mAh battery. The device also promises 1 day battery life which seems achievable with the current specifications. The side cover pops out to reveal two sim card slots and a MicroSD card slot, something quite unique and cool to look at. While the device is available in only two colors (White and Black) these shells are available in multiple colors.